Like many industries, the textiles industry is one which is always keen to adopt and develop new technologies - nanotechnology being just one. It’s called progress, and at the heart of all good progress, Research and Development teams are weighing up countless variables to ensure they’re building positively on what existed previously, moving their product forward for the best, and to meet the changing needs of their customers. Where it comes to textiles, some are manufactured to supply the fashion market, while high performance fabrics are needed for other applications - from heavy duty CBRN (chemical, biological, radiological, and nuclear) protection through to fire resistant fabrics in working environments such as foundries. Readers of Health and Safety International are representative of a wide range of industries and will have a need of just such highly developed protective textiles and, increasingly, nanofibres are playing a part in the efficiency of the end product - Personal Protective Equipment (PPE) in the shape of workwear. High on the demographics’ table for H&SI are industries such as power generation and petrochemicals. As such, research of the kind described below will have direct implications for the safety of your workforces. Protective textiles are garments or other fabric related items that are used to protect the wearer from environmental hazards. Protective clothing is currently an integral part of PPE and covers a major class of textiles, which are labelled as technical textiles. Protective clothing contributes 7% to the total technical textiles demand in the world market, illustrated in Figure 1. The use of technical textiles as protective clothing tends to produce low cost and low weight products with better reliability in service and greater energy savings. 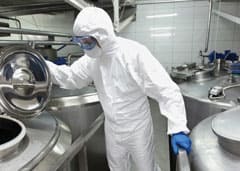 There have been growing demands for protective textiles because of rising health and safety concerns for those exposed to harsh environmental effects that may result in injuries or death1. Moreover, there are other factors such as stricter regulations for personal safety in the workplace, superior performance, safety requirements and the need for better management of multiple personal risks, which have driven further extensive research to develop protective clothing with improved performances. The European commission has therefore chosen protective textiles as one of the areas of lead market initiative. Although nanotechnology has found a number of applications in electronics and healthcare, the uses of this technology have been limited to specific applications within the textile field. The uses of nanotechnology in textile manufacturing have been increasing rapidly, however, because of its unique and valuable properties. This article presents an overview of nanotechnology applications for protective textile manufacturing. The main focus is on the benefits of nanotechnology, recent developments, limitations and future trends of nanotechnology for protective textile manufacturing. Nanotechnology involves the utilisation of nano-sized materials, typically of 1-100nm diameter, to produce novel structures with significantly improved properties. It can be described as the activities at atomic and molecular level, which have real world applications. Nanotechnology is a ‘bottom up’ technology, where bulk materials are formed from tiny blocks, unlike the ‘top down’ approach adopted by traditional manufacturing processes. The properties of materials change dramatically when they are converted into a nano-sized shape and are very much different from bulk materials. Moreover, nano-sized materials exhibit better performance characteristics than bulk materials. Nanotechnology not only produces minute structures but can also give thorough, inexpensive control of the material’s structure. The functional properties produced by conventional methods are often not durable after laundering or wearing. With nanotechnology, however, it’s possible to provide highly durable properties to textile materials. This is due to their notable characteristics such as large surface area-to-volume ratio, extremely small pore dimensions and superior mechanical properties, thereby offering better penetration into the fibres and better durability of functional finishes. Early in 2012 the emergency response community in the United States began to see products being introduced to the marketplace that complied with new product performance quality standards. This is likely to have implications for hazmat protective clothing worn in all kinds of industrial contexts. There are many regional standards chemical protective suits must comply with to ensure they meet stringent performance requirements. In Europe, EN certification is required, while in the United States and Canada, NFPA is the primary certification standard that applies. The European Committee for Standardization (CEN) defines and maintains the certification standards and it is the EN 943 standard which covers protective clothing against liquid and gaseous chemicals, including liquid aerosols and solid particles with a specific section, EN 943-2, dealing with chemical protective suits for emergency responders and firefighters. Also of interest is that under the European Union Council Directive 9/686/EEC on PPE, protective clothing is divided into six classes. Type 6 is the most basic level of protective clothing for dust and dirt nuisances, while Type 1 refers to fully encapsulating protective clothing. European directives also require that all PPE carries the European Conformity (CE) approval and label, regardless of type and category. The benefits of nanotechnology could be exploited in protective textile manufacturing by using nanocomposites and nano-scale fibres, functional nanoparticles, novel surface treatments and coatings that could potentially provide improved protection together with better comfort3. Extensive research has been carried out to develop nanotechnology based protective textiles to make smart or intelligent textiles alongside defence and security applications, ballistic protection, fire protections, Ultraviolet (UV) protection and protection from bacteria. The defence and security personnel, fire fighters and medical personnel are always exposed to various kinds of biological and chemical threats, as, indeed, are employees working in industrial settings where chemicals are used. Higher levels of protection are obviously required for these individuals. The protective clothing currently available for defence sector cannot provide sufficient protection from modern weapons. In addition, it is very expensive, bulky and not comfortable to wear. The application of nanotechnology would potentially produce lightweight and comfortable protective clothing with improved protection for defence personnel, because of its novel properties at nano level. Nanofibre-enabled protective textiles have the potential to detect chemical and biological warfare agents effectively because of their ability to filter and destroy harmful toxins. The nanofibres’ composites are prepared by mixing metal oxide nanoparticles such as magnesium oxide with a range of polymer solutions, and incorporated into membranes. The resultant products have been tested for warfare agents and found to be more effective than currently used charcoal. Moreover, the nanofibres can serve as carriers of active functionality that can detoxify the warfare agents without adding extra weight to textiles. Nanofibres filled with metal oxide nanoparticles can be incorporated within clothing to provide enhanced protection against aerosols. Aramids, PBO and UHMWPE fibres and ceramics are currently used to produce protective textiles for ballistic protection, but they do not provide sufficient resistances despite their extremely high theoretical strengths. In recent studies, nanofibres have shown great potential to be used for ballistic protection. One company is thought to be developing body armours by using a nanocomposite based on inorganic fullerenes (IF), which is twice as strong as any other impact-resistant material currently used, and five times stronger than steel. Carbon nanotube has great potential for making antiballistic materials due to its high strength, lightweight and excellent energy absorption capacity. Mylvaganam and Zhang have investigated the potential of using carbon nanotubes against ballistic impact. They summarised from their study that body armour of only 600µm in thickness, made from six layers of 100µm carbon nanotube yarns, may bounce off a bullet with muzzle energy of 320J. They also mentioned that the ballistic resistance capacityis greater at the centre of a carbon nanotube, and a tube with a larger radius can withstand higher bullet speeds. These fundamental results are only applicable provided that the multiple yarns containing many millions of carbon nanotubes behave in the same way as a single nanotube. Recently produced yarns of multi-walled carbon nanotubes can be used to make bullet proof vests as strong as existing products, with an additional offering of 48% reversible damping and much higher thermal, creep and chemical resistance. Flame retardant protective textiles provide an opportunity for nanotechnology to take over the existing technology due to the health and environmental impacts of existing halogenated fire resistant materials. Wang et al have investigated the effects of nano-scaled layered double hydroxides (LDH) and nano-titanium dioxide to improve the fire resistance and anti-ageing properties of fire retardant coatings found great improvements in the properties. In another study, they reported that the fire protection properties of acrylic nanocomposites coating was better than any conventional acrylic resin. Moreover, nanocomposites demonstrated good fire resistance and ageing with the addition of 1.5% nanoclays. Bourbigot et al, however, suggested that the best protection from fire is obtained by using a combination of conventional flame retardants and nano fillers. In sports and outdoor applications, the breathability and comfort of clothing is in high demand with water, soil and oil proof protection. Waterproof breathable fabrics can be produced by nano-scale modification of the surface roughness, thus allowing the water and dirt to roll off the surface, but water vapour can still pass from the inside of the clothing through to the surface of the fabrics. Kang et al have produced breathable waterproof fabrics by applying a nano-scaled electrospun polyurethane coating on the fabric surface. The UV blocking properties of fabrics can be achieved by coating textiles with nano-sized particles of zinc oxide or titanium oxide. Xin et al have applied a thin layer of titanium oxide on cotton fabrics by using the sol-gel method, and have achieved good UV blocking properties of treated fabrics even after 50 home launderings. The antibacterial or antimicrobial properties of textiles can be obtained by coating with nano-sized silver, titanium dioxide and zinc oxide particles. The use of nanotechnology provides increased numbers of particles per unit area, thus maximising the antibacterial effect. In a review paper, Wong et al cover all - including the last three concerns above - elements addressed in this article, and argues that the huge range of the applications for nanotechnology extend to many areas. He suggests that the properties imparted to textiles using nanotechnology include water repellence, soil resistance, wrinkle resistance, anti-bacteria, anti-static and UV protection, flame retardation, improvement of dyeability and so on. Nano-enabled fibres and fabrics allow the incorporation of sensors and electronic devices into the textile structures to produce smart protective textiles. This type of clothing has the capacity to capture inputs from the surroundings and respond accordingly. Moreover, they can store energy and help to provide personalised control by monitoring physiologic parameters, thus working as a survival tool for people who are exposed to hazardous working environments. Currently, most of the smart protective textiles are still at the development stages although some are already quite close to large production. Since the advent of nanotechnology, the textile field has been trying to utilise its benefits to enhance the performance characteristics of textile products, thus creating enormous opportunities and challenges for this field. There are, however, some important issues related to productivity, performance, scale-up and cost which need to be considered for successful application, and commercialisation of nanofibres and related products. A list of economic barriers has been compiled in a report by ObservatoryNano on protective materials, which includes procurement restricted to the public sector, requirements to meet strict standards and regulations, protection of intellectual property and lack of available funds. In some cases, it is extremely difficult and complex to process nano-fibres and related products by using conventional textile processes; for example, carbon fibres of nano-size. There have been growing concerns regarding the health and safety of personnel involved in the production, conversion and even use of nano-fibres and their products. Chinese researchers have identified that nanoparticles could cause lung disease and possible remedies have also been suggested. Any short term or long term health risks related to the use of nano-particles are still unclear, however. The EU market size of PPE is estimated to be worth €9.5-10 billion and is forecast to grow by 7.6% in the period 2012-2016 because of the rising awareness in personal protection. Similarly, the use of nanotechnology for making textiles is expected to grow rapidly and the highest growth rate is predicted outside traditional textiles such as protective textiles, which are less sensitive to cost. New threats and challenges both in the workplace and in daily life will be an important driver for further developments in the protective textiles market. Moreover, strict regulations and growing workplace standards will push protective textile manufacturers forward to explore new technologies. Therefore, strong socio-economic market drivers will strengthen the diffusion process of nanotechnology application in protective textiles manufacturing. Future applications of nanotechnology in protective textiles will be based on two broad objectives: the improvement of currently available products and the development of smart and intelligent textiles. After an extensive literature survey, Gordeyev and Crawley suggested additional areas for further research, which include catalysts functionalised on nanofibre membranes, development of a woven protective garment by combining layers of different nanofibres, and the development of magnesium oxide nanoparticles based nanofibre membranes. Other areas highlighted for further research are assessing the bullet impact of carbon nanotubes under different loading conditions, improvement of operational effectiveness and capability of first responders for reducing injury and loss of life, and the development of active decontamination materials to protect responders from threats. The development of currently used protective textiles is essential to meet the increasing demands and standards of personal protective equipment. Nanotechnology can play a very important role in developing novel protective materials by providing lightweight fabrics with significantly increased levels of protection and improved comfort. Nanotechnology based protective textiles are still at the development stage and extensive research is required for the successful production of these products on a commercial scale. Moreover, the health and safety concerns related to nano-based products require thorough investigation.